Understanding the basics of your radio control gear, and how it operates to make your rc plane do what you want it to (most of the time! ), is important if you're to get the most out of your new hobby. Incidentally this page was originally written before the advent of 2.4GHz (gigahertz) rc transmitters and receivers, so it mainly talks about the traditional MHz (megahertz) radio control gear. But with that said, the fundamental operating information is the same for both types. The basic components of a typical radio control system are the transmitter, receiver and servos. Battery packs, or individual cells, are needed to power all the components. However, receivers and servos of modern electric power (EP) rc airplanes don't usually have their own battery pack because their power is taken directly from the motor battery pack via what's known as a BEC - more on that later. But these days it's more common to buy just the transmitter and receiver, or even just the transmitter alone, without any servos. This is simply because servo type and size varies so much these days, because their applications are far more varied than ever before - it would be hard for the manufacturer to know which type of servo to put in the box, so far better to leave the choice up to the pilot! Also, many mass-produced aircraft (i.e. RTF, BNF & PNP type models) come with servos (and receiver) already installed, so the buyer doesn't necessarily need separate ones. In the radio control hobby the word channel, which you'll see a lot, has two completely different meanings. The first meaning is the number of channels that a radio control system and airplane has, and in this case the word channel refers to each separate controllable function of the plane. A one-channel rc airplane has only one function that can be controlled by the pilot, for example rudder movement or electric motor on/off. Two channels could be rudder and motor while 3 channels could be motor, rudder and elevator or motor, rudder and ailerons. A typical 4-channel rc airplane will have rudder, elevator, throttle and ailerons, the four primary rc airplane controls. You'll often see channel abbreviated to ch. - for example a 4ch. rc plane. There are no hard and fast rules as to how many channels an rc airplane can have, it is purely dependant on the plane itself and/or how many functions the pilot wants to control. More complex rc airplanes may require 6, 7, 8 or more channels to operate the primary controls plus any additional functions such as retractable landing gear, flaps, landing lights, parachute deployment, camera operation to name a few. The second meaning of the word is the channel number and this refers to which radio frequency channel the radio control gear is operating on. Different countries have different frequency channels, legally designated for radio control flying, that fall within certain ranges of the MHz frequency band. The designated frequency channels are numbered and no two pilots can fly together on the same MHz channel at the same time, because one rc system would interfere with the other, causing serious control problems for both pilots! You can learn more about the MHz frequency channels here. It's worth noting at this point that only MHz radio control gear uses designated frequency channels. The 2.4GHz radios don't use the same technology and so separate frequency channels are not necessary. This is one huge advantage with 2.4GHz systems - you don't have to worry who else is flying, as there is no risk of unwanted radio interference from fellow fliers. The transmitter, commonly just called the radio, is the main box that you hold and use to control your rc aircraft. There are several different configurations of transmitter available within the radio control hobby in general, the common types are shown below and are (from left to right) traditional 4+ch., single-stick 3ch. with slide motor control, two-stick 2ch. and a pistol grip 2ch. (commonly used with surface vehicles). By the way, the collapsible aluminium antenna on them indicates they are all MHz ones. Newer 2.4GHz TX's have shorter, plastic antennas as shown in the lower picture. 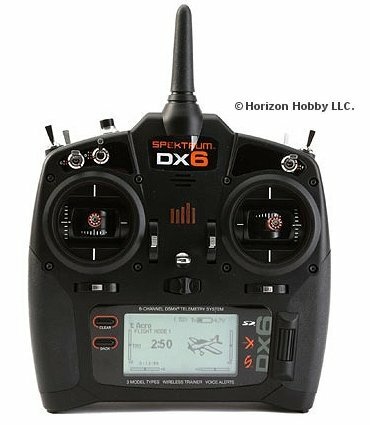 Above: a newer 2.4GHz transmitter, the popular Spektrum DX6. For the purpose of this page we'll focus on a traditional multi-channel (4 or more) rc airplane transmitter because that's the type you'll most likely use as you get in to the hobby, be it a MHz or GHz one. Such a TX consists of two control sticks, trims and switches and possibly rotating dials and/or sliding levers on the face and top of the transmitter body, so as to be within easy fingertip reach. These switches, dials and levers are used for any channels over and above the primary controls, for example retractable landing gear and flaps. These extra channels are called auxiliary channels. On a MHz transmitter there is also a collapsible antenna on top of the TX, while a 2.4GHz TX has a much shorter antenna which doesn't collapse - it's only about 6" (150cm) long compared to the 3' or 4' long MHz antenna. This difference in length is because 2.4GHz radio waves have a much shorter wavelength and so require a shorter antenna. Depending on whether or not the transmitter is computerised or not, there will be a LCD screen to display all the relevant information to the pilot - programmed settings, menu options, battery voltage, timer etc. If the TX isn't computerised then there will be a simple battery voltage meter or indicator lights on the face of the TX, and no LCD display screen. The majority of transmitters these days are computer ones, and only the most basic TX's are non-computer. On a 4+ch. transmitter both sticks move up & down and left & right to enable two functions to be controlled with each stick. These are the 4 basic channels, and the switches/dials make up the other channels - 5th, 6th etc. The transmitter trims are essential for trimming the flight characteristics of the airplane, and to iron out any unwanted tendencies that the plane may have in the air. They work by moving the respective control surface by a very small amount, and in effect they are used to reset the neutral position of that control surface. Trims are essential during a maiden flight but if a lot of trim was needed during the flight then it's common practice to make adjustments to the airplane when it's back in the workshop, so that less trimming at the TX is needed with subsequent flights. Having said that, it's quite normal for minor trim changes to be made during every flight, for one reason or another. Above: analogue slide/ratchet trims (left) vs. digital trim buttons (right). As shown above, transmitter trims can be analogue (on the older radios), whereby small tabs need to be slid one way or another and are held in place by a ratchet, or more commonly on modern computer radios they are digital; buttons replace the tabs and when depressed each electronic 'beep' represents one click of a traditional ratchet trim. When any input is made by the pilot, be it moving a stick, flicking a switch or rotating a dial, a radio signal is sent out via the transmitter's antenna and is picked up by the receiver, located inside the model. That signal passes from the receiver directly to the servos and the end result is a proportional movement of the airplane's control surface, throttle or whatever. By proportional we mean that the movement of the control surface is a direct representation of how much movement was applied at the transmitter - a small stick movement will mean little movement of the control surface, while throwing the stick to its maximum position will mean full deflection of the control surface (with default travel adjustments in place). With the exception of basic toy rc transmitters, all radio control TX's are proportional to give us full control of our models. It's also important to mention transmitter modes but rather than talk about that subject on this already-long page, you can read about them through that link. The mode simply means the configuration of the transmitter, with regard to which sticks control which channels. Above: a MHz RX, left, and a 2.4GHz one, right. The receiver is located inside the model and is directly connected to each servo (and electronic speed control - ESC - in electric planes), by fine-gauge wires. A thin wire antenna extends from within the RX. With a MHz RX this antenna is 3' to 4' long and must be secured, in its full length, to the outside of the plane (typically attached to the fin or secured along the length of the fuselage). Your average GHz RX has one or two much smaller antennas, not much more than an inch or so in length. The long antenna of a MHz receiver should never be cut or looped up to reduce its length. By doing so the ability of the RX to receive the radio signal from the TX is drastically reduced and this usually has disastrous consequences. The plane will very quickly fly out of radio range, and you'll lose complete control. Once that happens a crash or a lost airplane is inevitable! In the same way as a traditional radio or TV receives the signal from the broadcasting station, so a radio control RX receives the signal that is emitted by the transmitter when you move a stick or flick a switch. These signals are then passed through to the servos, or ESC, which respond appropriately. The number of connection slots on a receiver depends on the number of channels i.e. a 5 channel RX will have 6 slots - one for each channel plus one for the battery pack connection. More complex receivers will have more slots. Above: servos come in various sizes, weights and strengths. As previously mentioned, the number of servos in an rc model varies according to the number of channels that the radio control gear has and the aircraft requires. A servo consists of a printed circuit board (PCB), an electric motor, a feedback potentiometer and a set of either nylon or metal gears that may or may not be ball-raced, all housed within a plastic or aluminium casing. The central shaft on which the gears sit is splined and exits through the top of the servo casing; the servo horn (output arm) is connected to the shaft and is held in place by a small screw. The feedback potentiometer (a type of variable resistor) is connected between the PCB and the gears and is also driven by the motor, and works on the basis of error correction. The signal from the receiver is interpreted by the PCB which in turn tells the motor in which direction to move; this movement continues until the potentiometer reaches the new position according to the most recent signal, at which point the motor stops moving. As the pot turns so do the gears and hence the shaft and horn as well. The horn is directly connected to the plane's control surface by some kind of control linkage (a rigid metal wire rod or Bowden cable, for example), so any movement of the servo horn results in direct movement of that surface, be it the ailerons, elevator, rudder or whatever. Servos typically have three (sometimes 5) fine-gauge wires connecting the PCB to the receiver - a positive, negative and signal wire which are generally colour coded according to manufacturer. The wires run into a plastic connector, the 'flat blade' type (shown right, in this case the Spektrum/JR type) being the most common. This is pushed into the appropriate channel slot of the receiver. 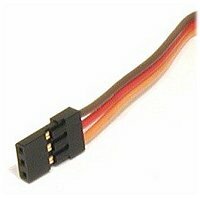 Note, though, that there are some compatibility issues between manufacturers although most connectors of this general type can be modified if necessary i.e if you want to mix one brand of servo with someone else's receiver. Servos come in various sizes and strengths, from tiny 'feather-weight' ones to giant 1/4 scale ones (so called because they're commonly used in 1/4 scale aircraft). 'Micro' servos have become increasingly common in recent years as rc aircraft have become smaller and smaller, these typically weigh between 5 and 10 grams although that is a generalisation. Digital servos are increasingly commonplace, although analogue ones still make up the bulk of the share. Digi servos offer faster response times (latency) and more holding power i.e the strength to hold a large control surface against the airflow, without failing. Obviously the strength of servo motor and gears also plays a large part in this too. Servo strength is measured in terms of torque, expressed in Oz.in (ounce-inches) or in kg.cm (kilogram-centimeters) depending on where you are in the world. Either way, the torque rating states how much force the servo can exert at a given distance out from the central shaft - for example, a 1.6kg.cm servo can exert 1.6kg at 1cm from the shaft. The further out from the shaft you go, the weaker the torque is and for double the distance, so the force halves. Conversely, if the distance is halved then the torque doubles. Another servo rating you'll see is servo speed and this lets you know how fast a servo shaft takes to rotate through 60°, in tenths of one second. The type and number of servos you will need depends entirely on the model you have, and what you want it to do. Crystals are used in the MHz radio control systems and determine which frequency channel the radio control gear will operate on. In North America, for example, rc aircraft have a designated set number of channels that fall in to the 72MHz frequency band, ranging from 72.010MHz to 72.990MHz. There are 50 different channels in all, spread at 20kHz intervals. 2.4GHz rc systems don't require crystals due to the different technology used. Both the receiver and the transmitter need their own crystal to operate correctly, both on identical frequency channels. The crystal typically contains quartz and works because of the piezoelectric effect - when an electric current flows through the quartz, it naturally resonates at a particular frequency. This resonance can be manipulated to determine which frequency is utilised. While certain radio control systems can use 'disposable' (alkaline) cells, it's a better idea to use rechargeable ones wherever possible. Although the initial cost is more, this cost is soon recouped as rechargeable batteries have an incredibly long life of around 1000 charges. Much cheaper in the long term! Nickel Cadmium (NiCD or nicad) rechargeable cells were traditionally used in radio control gear but Nickel Metal Hydride (NiMH) cells with a much higher capacity and better performance have all but made nicads extinct. Even more recently lithium polymer ion (Li-Po or lipoly) TX and RX packs offer even greater performance and are now taking the place of NiMH. A typical multi-channel rc system requires 8 cells for the transmitter and 4 for the receiver, although this isn't a hard and fast rule. However, as mentioned at the beginning of this page, receivers of electric powered (EP) rc aircraft usually take their power directly from the motor battery pack via what's known as a BEC, or battery eliminator circuit. The BEC is integrated in to the electronic speed control and it regulates a steady 5 volts (or so) from the motor battery pack to power the receiver and servos. Hence a separate receiver battery pack isn't required as it is in a glow plug powered plane. Where a TX requires 8 NiMH cells, it's always best to use a soldered and sealed pack, rather than individual cells. In such a pack, the cells are soldered together and this greatly reduces the risk of losing a connection, which would invariably result in your plane going out of control and crashing. 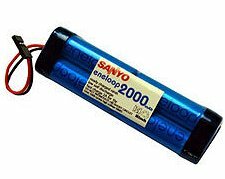 The radio control gear battery level is of paramount importance when it comes to rc flying - if even just one of the cells has a low voltage then you will not have control over your plane for very long, since a reduced voltage results in a very reduced radio range. Which radio control system is for you? The choice of radio control gear out there today is overwhelming and it's easy to become lost in that choice. But choosing a suitable radio needn't be difficult if you think it through. MHz or GHz - without a doubt 2.4GHz! MHz radios, although still used and perfectly fine, are on their way out. Number of channels - you'll be hard pushed to find a new radio with less than 6 channels these days, but how many you need depends on how seriously you want to get in to the hobby. If you're quickly going to get in deep with more complex models, then you might soon outgrow a 6-channel radio and an 8+ channel one might suit you better. Features & functions - modern computer radios already do more than the beginner needs but, again, if you see yourself getting seriously in to the hobby then you'll be needing at least a mid-range radio, not a basic bottom end one. Essentially, the more complex the plane you want to fly, the more complex the radio needs to be. Comfort - easily overlooked, but if you're not happy holding the thing that controls your aircraft then your enjoyment of using it will be dampened. If you can get along to a local hobby shop, try out a few radios and see how they feel in the hands. Reputation - by this I mean reputation and reliability of the brand. Steer clear of the Far Eastern radios going cheap on eBay that nobody has ever heard of, and go with a mainstream brand - there are plenty to choose from these days. Top brands include Spektrum, Futaba, JR, HiTech, Graupner, Multiplex to name a few. New or used - if you can afford it, always buy new. Buying a used radio carries a risk; you don't know its history, how badly it's been treated or even if its stolen goods! If you really do need to buy second-hand, try and buy something from someone you know who has treated it well. Which mode - this is more than likely going to be determined for you, but if in doubt opt for Mode 2 because it's by far the most widely used. Well hopefully this page has given you an insight in to how your radio control gear does what it does. As I said at the start of the page, take the time to understand your rc system and you'll get a much more rewarding experience - don't just 'waggle the sticks' without knowing what's going on behind the scenes! This whole topic is covered in more detail in my e-book The Beginner's Guide To Flying RC Airplanes, along with everything else you need to know about getting started in this exhilarating and somewhat addictive hobby! The e-book answers all the questions that you're likely to want to ask, and takes you step-by-step all the way to get you flying an rc airplane quickly and safely. If you're in the market for some radio control stuff, please support your local model shop where possible.